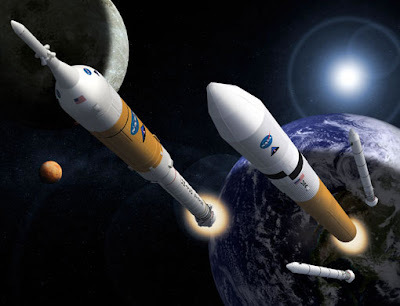 After spending over $9 billion towards returning humanity to the Moon for a permanent presence there, NASA has been told that the Constellation Program is scrapped. No moon for you, NASA! No stepping stone space habitat to help get to Mars and beyond. 'The U.S. can't afford it! ', scream the bean counters. Oh really. There is a significant elephant in the room, and it, as usual, is getting to eat nearly all the peanuts. If just 10% of the annual budget for the U.S. Department of Defense Offense had gone to NASA over the last 50 years, we would be sending shuttles to the Jupiter system by now, not axing the Moon. Over the last 50 years, the total investment in NASA (including Apollo) has been equal to the U.S. Department of Defense Offense budget for a single year. EVERY single year. To make war toys and train toy soldiers to fight manufactured enemies. And many people see this as money well spent.